As adults, especially parents, it is easy to find ourselves stressed out more often than not. There is a lot to take care of: bills, kids, spouses, meal times, the house…and it seems like there’s so little time to do it all. It’s no wonder stress is sky high for so many! However, there is hope. 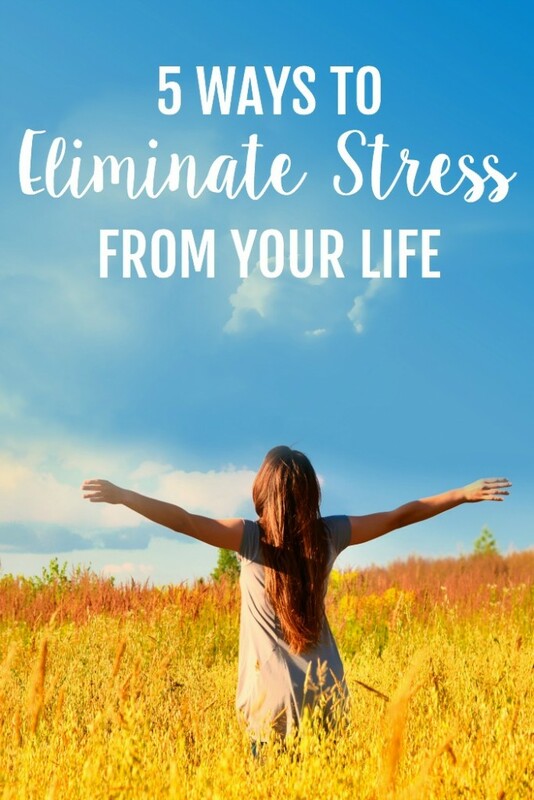 Below are five ways you can eliminate stress from your life, making way for a happier and healthier you! Healthy meals, drinks, and snacks each day help your body cope with stress and keep it at a maintainable level. A well-balanced diet ensures your body has the nutrients it needs to feel better, more motivated, and less worried. Avoid caffeine, especially coffee, as it can cause you to be jittery, and it can actually heighten anxiety and stress. Our bodies need rest in order to keep stress at bay. Make sure you are getting the optimal amount for your body, which is typically 7-9 hours a day. Stay away from the TV, cell phone and other devices that stimulate your mind for at least an hour before bedtime. Create a relaxing environment in your bedroom with the help of fans or white noise machines, and begin a bedtime routine that allows you to wind down before hitting the pillow. Going out every weekend after working late and getting the kids to their activities may seem fun. However, overdoing it is a great way to increase your stress levels, and keep them high. Start prioritizing your responsibilities, and learn to say no more often. Cutting back on commitments gives your body more time to chill and relax at home. While cutting back on your commitments is important, make sure exercise is not one that gets the boot. Studies have proven that working out regularly can increase endorphins in the brain, a chemical that gives us that happy feeling. Along with decreasing stress, exercise can also help ward off anxiety and depression. It is easy to overlook your own health and well being when there is so much going on in life. However, self-care is essential if you want to alleviate the stress you feel on a daily basis. A nightly 30-minute bubble bath, weekly manicure, or monthly spa day gives you the time you need to clear your mind and just rest your body so you can meet the day feeling renewed.